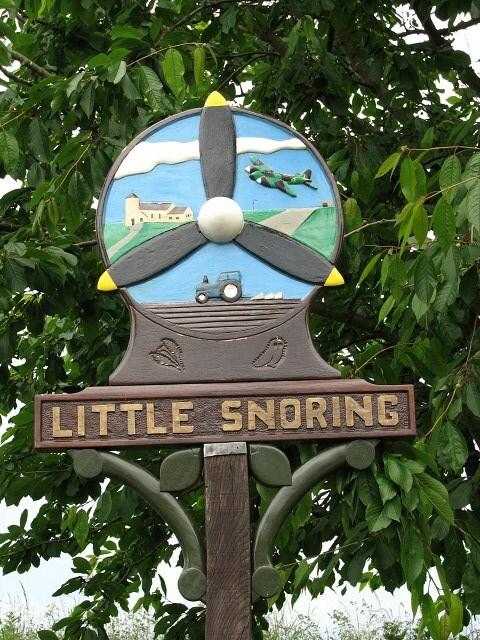 Little Snoring has an entry in the Domesday Book of 1085. In the Great Book Little Snoring is recorded by the names "Esnaringa", "Snaringa" and "Snarlinga". It was the king's land with the main landholders being William de Warenne and Peter de Valognes and his main tenant is said to be Ralph. Within the parish of Little Snoring, at a place called Queensgate, was situated a house of the Order of St Lazarus. It is mentioned in the will of Alexander, Rector of Snoring Parva, in 1380. Nothing further about the house is known. The church of 'Little Snoring St Andrew' is one of 124 existing round-tower churches in Norfolk. The church and its separate tower are Grade I listed buildings. The village has an airfield, formerly RAF Little Snoring, part of which is still active as a private airfield, whilst the other part now belongs to a potato-producing company. Village amenities include a school, post office and a public house. The nearest railway station is at Sheringham for the Bittern Line which runs between Sheringham, Cromer and Norwich. The nearest airport is Norwich International Airport.